How do you organize your DVD collection? Organizing by alphabet or genre doesn't quite cut it when the library grows large! You still have to sort through all the hundreds of DVDs reading the tiny edge of the cases to find what you want to watch. Also, the bigger the collection, the more space they take up and they can begin to over run your home! Unless you have a lot of extra space, you may need a way to organize your DVD collection to keep its space down to a minimum. And even if you do have the space, you may just want to better organize and catalog your collection so that it's more convenient to know what you have and find something when you want to. 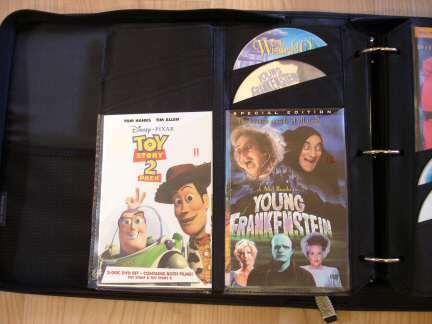 There are several types of DVD organizers on the market. To go this route, you will need to be willing to part with the cheap plastic DVD cases as well as be comfortable with the likelihood that you’ll have to fold the cover art. You can keep the special box sets and cases in another storage unit. If you’re OK with that, then read on. NOTE: The binders my household uses are made by Soundkase. Unfortunately, as of February 2012 I can no longer find them available. Don’t worry about alphabetizing your DVD collection or arranging them by genre as this will only cause yourself more work in the future. Who wants to have to move all the DVD’s over one spot to make room for one new DVD? This just isn’t sensible in the long run, especially with the more DVD’s you own. If you purchase a DVD binder that has removable pages, this will be less of an issue as you can insert a new page when needed, but still not necessary. If you buy more than one binder at the start of this project and you wish to, you can designate a genre to each binder. Most importantly, you may want to have a children’s binder separate from all the R-rated films. Other than that, I recommend putting your DVDs into your binders in any format you prefer to begin with. But as you add new DVD’s, you’ll just add them to the next spot in the binder you feel is most appropriate. Don’t forget to find a storage bin that works for you to store any special DVD sets that you don’t want to put into the binders. 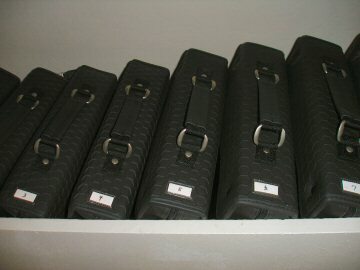 Label the binders as you see fit. Numbering them 1 through 10 works just fine (or how ever many binders you have). Use a label maker if the binder doesn’t come with a label window. Then, on the inside, you need to label the pages. Depending on the material of the pages in your binder, you can use a permanent marker, wax pencil, fabric ink or stickers. Number each page. In the end, this allows you to then find a movie based on the binder number and page number. Keep in mind that the binders are just for storage. They in themselves are not intended to make it easy for you to locate movies. But how then will you find what you’re looking for?? With the use of some sort of organizing software! You can go with your basic spreadsheet to organize your DVD collection. Open a worksheet and enter the information you find pertinent (Movie title, genre, year, actors, etc.). And then, most importantly, log in the binder number and the page it’s on. If you need a little help deciding on genre or finding additional information that might not be on the DVD insert, you might want to check out Amazon or Netflix online for helpful information. You can now sort by title, genre or whatever category you need to find what you’re looking for. 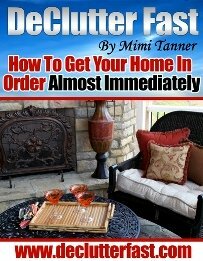 Once you locate it on the list, you will see which binder and page you’ll find it in. If you want something a little more elaborate and even fun to use, you might want to go with a program designed specifically to organize your DVD collection. There are several programs available at a reasonable cost and you can even find some that are free (just beware of ad-ware and spy-ware). One such software program for Mac users is called Delicious Library. This is the program we currently use in our home. I was a bit skeptical at first, but now I’d have to say it’s quite fun and convenient! When you purchase a new DVD, all you need to do to log it into your library is to scan the barcode using your web-cam or type in the barcode by hand. It will download the cover photo and all the details within seconds from the internet. The only thing you need to add is which binder and page the movie is located in your physical library! You can then sort, search and browse your library with ease. When you want to watch a movie, hop on over to your computer and open Delicious Library to browse what you want to watch. When you find your desired movie, check which binder and page it’s in and off you go! All you need is the pop-corn! There are several of these products on the market for Windows PC’s as well. Be sure to check reviews and find a program that suits your needs. If you don’t need all the bells and whistles, then you may find a free product that will work just fine for you. However you decide to organize your DVD collection, it’s going to make things easier to access when you want them. And if done right, will also save you a lot of space! Be sure to shop around and find a binder style that works best for you. Also be sure to shop and compare the various DVD organizing products on the market to find one that you really enjoy using.